Every few years, CSTMS produces a report of its activities. These reports chronicle the vitality of the Center, and serve as a continuous narrative of its development. 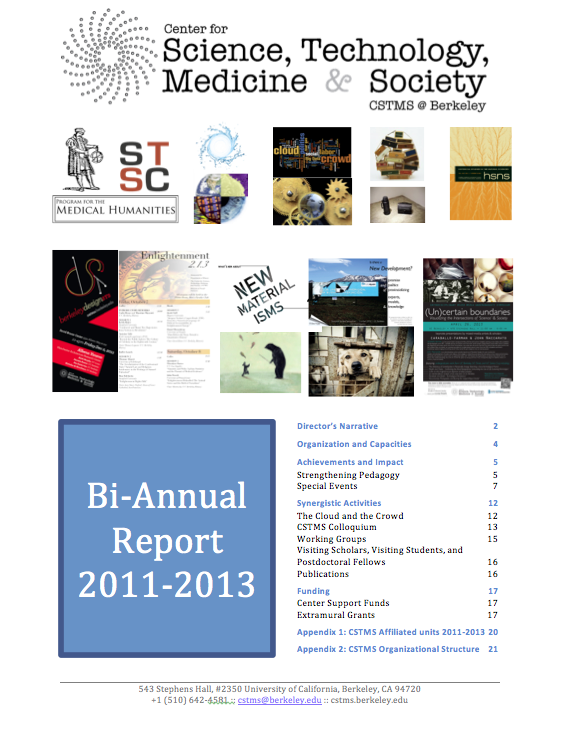 In this, our second bi-annual report, we review the wide range of teaching, research, and engagement CSTMS scholars have conducted in the 2011-2013 period. Below is Outgoing CSTMS Director Cori Hayden’s welcome. To read more, download the full report. Inaugurated in the fall of 2009, the Center for Science, Technology, Medicine, & Society (CSTMS) is a major interdisciplinary center on the Berkeley campus, and a flagship unit within the newly constituted Integrative Institute for the Social Sciences. CSTMS is a consolidated, dynamic home for Berkeley’s intellectual communities in Science and Technology Studies, the History of Science and Technology, and the Medical Humanities. In the two years since the Center’s previous report, CSTMS has continued to grow and to register significant success in our three major areas of activity: pedagogy and student training; interdisciplinary research; and innovative programming and outreach. Reflecting the diversity of our constituent communities—which has benefitted from strong involvement of our faculty, graduate students, undergraduates, and visiting scholars—the Center continued to build its footprint in 2011-2013. We organized 10 major conferences and symposia, from the STS Forum on Fukushima (with Rensselaer Polytechnic Institute) to Enlightenment 2.1.3; we held public lectures by over 30 invited speakers from across the world; and we hosted 33 visiting scholars from Europe, East Asia, the US, and Latin America. We also secured funding for new research and pedagogical initiatives. The latter has largely been made possible by the intellectual energy provided by our three Postdoctoral Fellows and our Associate Director for Research. As a continuing NSF-funded postdoctoral fellow with PI Cathryn Carson, Dr. Mary Sunderland has created groundbreaking, effective pathways for teaching Ethics for Engineers within the College of Engineering. Dr. Harlan Weaver (CSTMS NSF Postdoctoral Fellow) organized two high-profile workshops on Critical Animal Studies (including the Spring 2013 Funny Kinds of Love: The Ethics and Affects of Human-Animal Relationships), drawing on his own research on the sciences of kind and breed. Dr. Nicholas D’Avella received a two-year grant from the UC Humanities Network for a multi-campus initiative on Cloud and Crowd, which will generate multiple opportunities for graduate and faculty involvement on campus and within the UC system. Alongside our postdoctoral fellows, the Center’s growth reflects the efforts of our Associate Director for Research, Dr. Samuel Evans. Among his many achievements, Dr. Evans has developed the Center’s international profile in the arenas of Security, Policy, and STS, with an IGCC seed grant on Science Governance and Risk Futures (with co-PI Professor David Winickoff) that led to Prof. Winickoff’s successful bid for an NSF project on geoengineering and Dr. Evans’ collaboration with several British universities (Exeter, UCL, Bradford) on a project analyzing security concerns within the life sciences. Together, our researchers have brought wonderful intellectual energy, programmatic substance, critical mass, and new opportunities to CSTMS. The graduate communities in History of Science & Technology, and Science & Technology Studies are also thriving. Our second cohort in the Graduate Designated Emphasis (DE) in STS was admitted in Fall 2012, and the DE students initiated the new STS Working Group and organized a major Spring 2013 conference, “Is there a New Development?” The OHST Working Group and Master Class series are also thriving, and we congratulate two of our 2013 graduates in the Designated Emphasis and in OHST (Emily Redman) for receiving tenure-track jobs in major universities within the US. Javiera Barandiaran will take up a position as Assistant Professorship in Global Environment and Law at UC Santa Barbara’s Global & International Studies Program. Emily Redman has accepted an Assistant Professorship in the University of Massachusetts Department of History. CSTMS undergraduates, funded through the Townsend Center’s Course Threads program, conceived and organized our first Undergraduate Science and Technology Studies Symposium, “(Un)Certain Boundaries,” in Spring 2013. The event was notable for its scope and degree of participation, drawing over 20 undergraduate presenters from UC Santa Cruz, UC Davis, and UC Berkeley, and featuring keynote presentations on the interface of art and science from visiting artists John Naccarrato (Montreal) and caraballo-farman (New York). Other conference highlights included the highly successful “Boundaries of Narrative” event (April 2013) organized by the Program in Medical Humanities (PMH) and the Fourth West Coast Symposium in the History of Medicine (May 2013), a collaboration between OHST and the University of Calgary. The Center’s outreach efforts also included the publication of 8 new issues of the leading academic journal, Historical Studies in the Natural Sciences, and we are currently overseeing several extramural grants. CSTMS’ growth and dynamism in this period has been based in part on the effective use of start-up funding, supported by renewable funds. In the coming years, we foresee enhanced synergy with the newly-constituted Institute for the Integrative Social Sciences, which we will be an important partner in developing new research collaborations and funding opportunities. Finally, I am pleased to welcome our new Director, Massimo Mazzotti. Professor Mazzotti is a core member of the CSTMS community and the current Director of OHST. In line with our by-laws and governance structure, Professor Mazzotti will serve as Director for the next three years, beginning July 2013. CSTMS has a great deal of momentum, and we look forward to this next phase in the Center’s trajectory. CSTMS was launched in AY 2010-2011 in the context of broader efforts on campus to identify and strengthen areas of research that could benefit from the consolidation of administrative capacities and enhanced collaborative opportunities. No university in the world can match the distinction of Berkeley across the sciences, engineering, humanities, and social sciences. CSTMS is at the crossroads of these disciplines – and as such is ideally placed to develop Berkeley’s role as a leader in this new area of knowledge production and practice. We have unusual faculty strength in studies of the societal implications of technology, medicine, and science, and we are in an excellent position to play a leadership role on these important themes. Faculty have been stimulated by connections on campus to collaborate across programs and colleges on topics ranging from understanding error in medicine to studying the relationship between technology and politics in nuclear waste disposal. However, the fragmentation of reporting arrangements, support services, and funding previously kept this sort of work on a small scale. The result has been that Berkeley, in a class by itself in the breadth and depth of the relevant academic disciplines, has, until now, lacked a center that mobilizes this interdisciplinary excellence. With the inauguration of CSTMS, it is now possible to consolidate disparate initiatives and provide the infrastructure to increase their scholarly productivity, range, and impact. This is the right moment to build on what we have accomplished already – in research, in faculty hiring, in education, in outreach – and take them to the next level. We have a committed group of faculty at all ranks who are ready to make the most of this opportunity. CSTMS’ agenda has been framed thus far through collaborations among the leadership of three entities with complementary approaches to the social and humanistic studies of science, technology, and medicine: the Office for History of Science and Technology (OHST), the Science, Technology, and Society Center (STSC), and the Program for the Medical Humanities (PMH), brought together in 2009-10 by the Social Science Dean, Carla Hesse. (See Appendix 1 for a brief description of each unit). In line with our mission to provide a galvanizing intellectual center for all interested members of campus, a broad range of faculty input was solicited in Fall 2010. On September 24th, 2010, over 40 members of the faculty attended the two-hour CSTMS Inaugural Retreat, with an introduction by Dean of Social Sciences Carla Hesse. Participants ranged from Assistant Professors to Emeriti, representing fields as diverse as Art History, Engineering, History, Spanish and Portuguese, Anthropology, and Environmental Sciences, Policy and Management. Among the significant and concrete outcomes of the retreat were two successful proposals for new undergraduate and graduate training programs in science and technology studies – an accomplishment that has eluded us on this campus for many years. 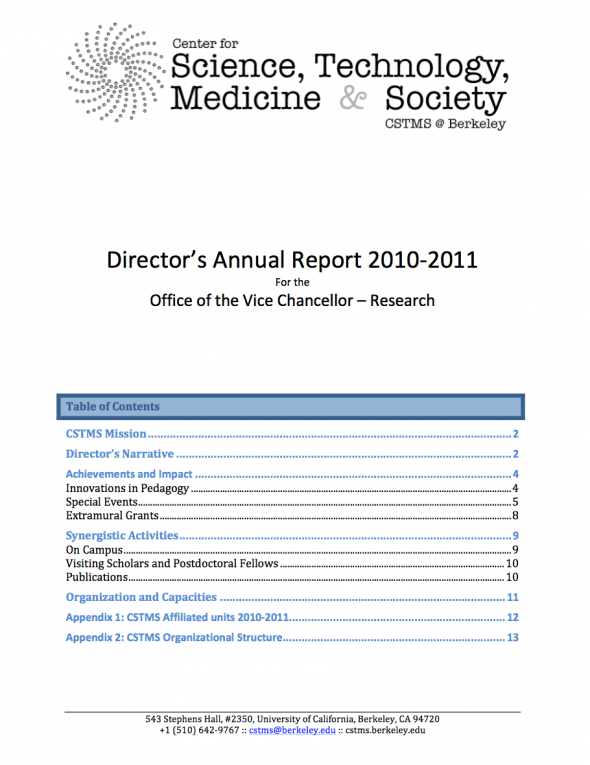 In its first year, 2010-2011, CSTMS established a strong footprint within Berkeley and the broader academic community. Highlights included securing funding for a new Undergraduate Course Thread in The Sciences and Society; running 18 invited lectures; 4 conferences of broad public and interdisciplinary interest including the major Nuclear Futures symposium and the highly successful symposium, The Reinvention of Time; Rapid Response events on the nuclear crisis in Japan (co-sponsored with Engineering and the Institute of East Asian Studies); and performances involving the Program for the Medical Humanities and members of the Berkeley community. The Center’s outreach efforts included the publication of 4 new issues of the leading academic journal, Historical Studies in the Natural Sciences, and we are currently running four extramural grants.